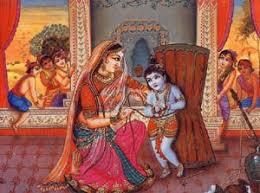 I have never read or listened to how Krishna was tall while Yasoda was tying him to the mortar stone. Someone claims that Krishna was about 4 and a half meters tall when he reached adolescence, while the Pandavas were more than 6 meters high. As for the mortar stone we saw in Gokula, remember that what is said in Vraja is not always the truth. Until we find some document that guarantees us that this place is really where Krishna was bound by Mother Yasoda and that this was really what is left of the mortar, we can not reason with that. Indians are famous for inventing “holy places” that are such only because then people give them money. We should trust only Sastra, Guru and Sadhu. If however that was really what is left of the mortar stone of Yasoda Mayi, it is clear that it would only be a part of the original.